UK holidaymakers are being hit with a fee to pay by certain credit cards, but the airlines say they are within the law. Which? takes a closer look. UK customers can no longer be charged for paying with their credit and debit card under new rules introduced on 13 January 2018 – but Which? Money has learned KLM and Air France are continuing to hit some holidaymakers with a fee at the checkout. An investigation by Which? Money has found the airlines may be using flawed technology to incorrectly charge users a fee – while the legislation also gives non-UK companies a surprising exception to the rules. The Which? Money Helpline has had a number of confused customers call in to say Air France and KLM (part of the same airline group, AFKLM) are applying a 2% fee for payments with some MasterCard and all American Express credit cards online. The ban on surcharges has been widely adopted by government bodies and retailers, including airlines and travel companies. So why are KLM and Air France continuing to apply a fee, when so many of its rivals have fallen into line? We take a closer look. What are the UK card surcharge rules? As of 13 January, new EU rules banned retailers from charging customers a fee to use Visa and Mastercard credit or debit cards (with the exception of corporate cards). The rules were introduced as part of the EU’s second Payment Services Directive (PSDII), and apply to all purchases made where the banks of the consumer and retailer are within the European Economic Area (EEA). But the UK has gone further than other EU states with its legislation. Rather than limiting the ban to Mastercard and Visa, UK retailers are not allowed to charge a fee on any ‘payment instrument’, including American Express and payment platforms like PayPal (though again, commercial cards are excluded). At first glance, these rules appear black and white. But we have found two ways that UK consumers may be caught out on Mastercard and American Express payments, which have come to light from investigating the fees KLM and Air France are continuing to charge UK customers. What fees are KLM and Air France charging? To verify what callers to the Which? 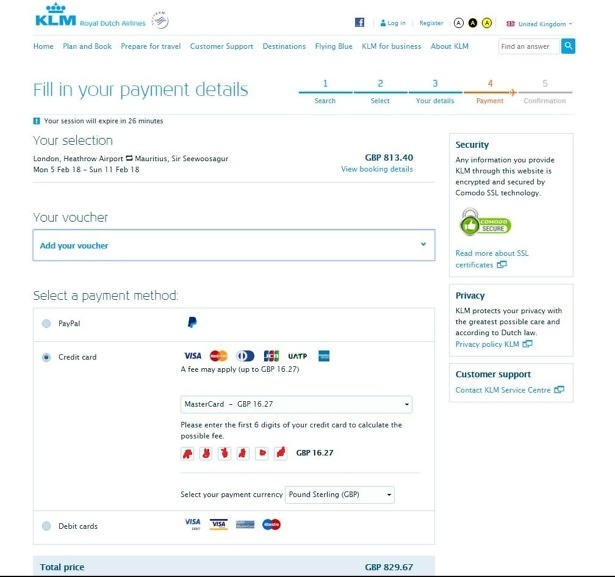 Money Helpline were reporting, we tried to book a flight on the UK sites for KLM (https://www.klm.com/home/gb/en) and Air France (https://www.airfrance.co.uk/) using three personal credit cards and a debit card. The payment pages for both airlines gave us the option to pay by PayPal, bank transfer, credit or debit card. The option to pay by credit card warned that a fee may apply. For the Visa or Mastercard credit card option, we were asked for the first six digits of the card number – known as the Bank Identification Number or BIN – to calculate whether we had to pay a fee. But the options for Diners Club, American Express, UATP/AirPlus and JCB did not require the BIN – and all charged a 2% fee as standard. Below we have set out the charges we encountered with each airline. First off we tried booking a flight from London to Paris – departing on 5 February and returning on 11 February 2018 – on the Air France website, which came to £108.53. At the checkout we tried out a range of cards, and found two out of four attracted a 2% fee, amounting to £2.13. We also tested a flight to Mauritius on the KLM website, departing on 5 February and returning on 11 February 2018, which came to £813.40. At the checkout, the same two cards were charged a 2% fee amounting to £16.27. 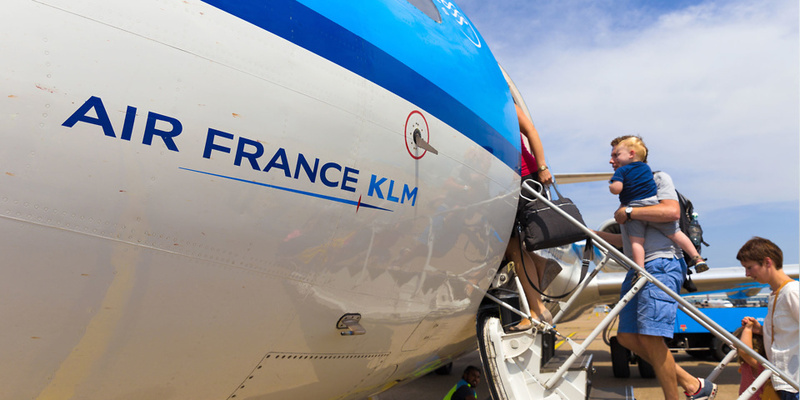 Our research led us to discover there are two potential pitfalls that UK customers might encounter, that worryingly might not be limited to just KLM and Air France. Are KLM and Air France allowed to charge for Mastercard? We found that KLM and Air France were charging a fee for payment by one Mastercard and not another – despite both being personal cards of a UK resident. This is against the UK and EU surcharge rules but it may not have been an intentional move from KLM and Air France. According to our enquiries, the problem came down to the technology that powers the sites’ Bank Identification Number (BIN) checker. The BIN tells a company the name of the bank that issued a payment card, the type of card, brand of card and – crucially for the correct application of the PSDII rules – whether it is classed as ‘personal’ or ‘business’. In our examples above, the BIN checker on both the KLM and Air France website mistakenly classed a personal Mastercard as a business card. We asked KLM about another example from the Money Helpline, where a caller with a Asda Mastercard was charged a fee for booking on the site. We only found the BIN issue with a Mastercard credit cards, but it’s possible that it applies to Visa credit cards that have been wrongly classified. AFKLM said it would investigate and raise the issue with the acquiring bank and ATPCO, the company that provide the Air France and KLM BIN checker. Are KLM and Air France allowed to charge for American Express? 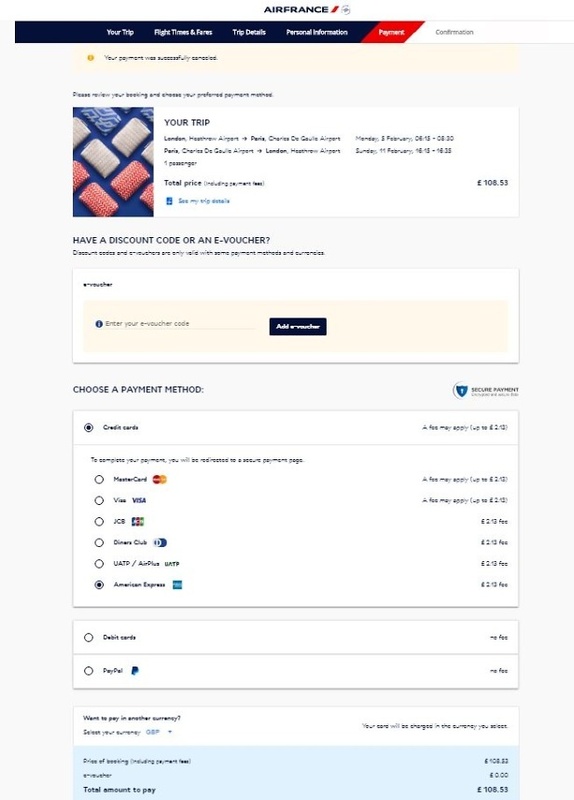 UK consumers booking flights on KLM and Air France may also be surprised to be charged a 2% fee when trying to pay using American Express. In this case, Air France and KLM aren’t explicitly breaking the rules, but relying on an exception within the legislation – one that many UK consumers may not realise exists. In Europe, the ban on surcharges outlined under PSDII only applies to purchases with Mastercard and Visa, while in the UK it applies to any ‘payment instrument’. Air France and KLM are based in Europe, so must abide by the standard PSDII rules. But despite marketing to UK consumers on a UK website, they don’t have to fall into line with the UK’s more robust payment regulations. This means they can continue to charge for American Express and other cards like JCB and Diners Club. But firms can’t just charge whatever they want. They still have to cap the fee to the cost of processing the payment. A spokesperson for AFKLM explained: ‘American Express is outside the scope of EU-regulation. Within Europe, VISA and MasterCards are not being charged if it is a consumer [personal] card. How widespread are these issues? The gap between the EU PSDII rules and the UK’s more robust version of them could create real confusion for UK consumers. Any UK shopper who arrives on the UK site for KLM, Air France or any non-UK firm operating in the EEA may expect the surcharge ban to apply – and indeed, many airline companies appear to have adopted the British regulations for their UK customers. But in reality, it is only UK companies that aren’t permitted to charge UK customers a fee to pay by American Express. What’s more, consumers trust that companies checking their cards can tell the difference between a personal and corporate card. But our investigation suggests the technology used isn’t up to scratch, and some customers may be unfairly charged. What can you do if you’re charged a fee? If you are charged a fee by a non-UK company to pay by American Express, make sure it’s not excessive. Alternatively, you can vote with your feet and see if you can get a better deal elsewhere. If you’re booking flights with a personal Mastercard or Visa credit card that gets hit with a fee, it’s worth challenging the company about it. For those who have booked a flight with KLM or Air France and already paid a fee to use a personal Mastercard or Visa credit card, you should be able to get your money back. After contacting the Which? Money Helpline, the customer who was charged a fee using their Asda Mastercard credit card complained to KLM and had the £20 fee refunded. You can also report the firm to your local Trading Standards, which can investigate further.